As 2018 comes to a close, Han Chiang High School once again opened its doors to welcome the new students of 2019 with its annual Orientation Day this 29th of December. 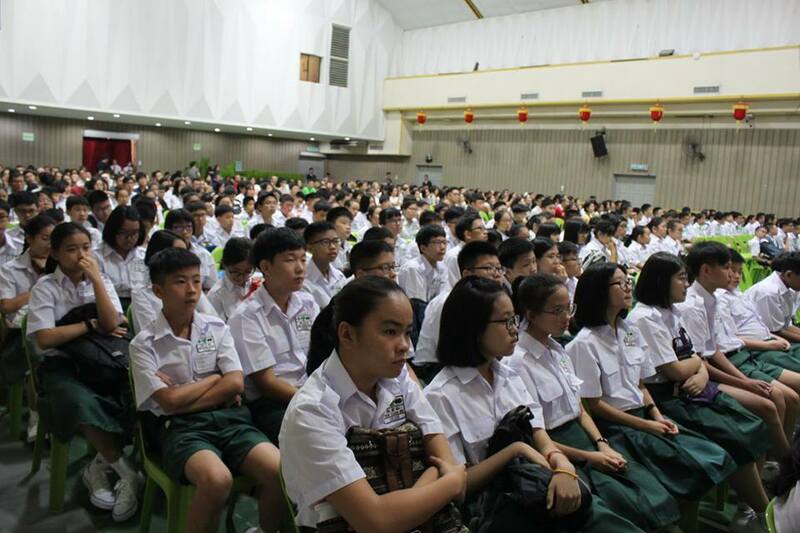 The event began at 8, but parents and students were seen filing in the hall for registration as soon as 7.30am. A short video regarding our school’s anniversary was also played. As an opening act, our school’s Chinese Orchestra put on a melodious performance. After that, speeches were given by the principal and the Chairman of Han Chiang’s Board of Directors. The Chairman of the Board of Directors, Dato’ Seri Ooi Soo Hing mentioned in his speech that Han Chiang has always been a strong advocate of quality education, which is what society requires. Therefore, the Board of Directors has never stopped creating an all-rounded and complete teaching environment. According to him, the wish of the Board is, with the help of the team of teachers, to bring out the best in every student. He further thanked the parents for their trust in the school, and hoped that they could work together with the school. Furthermore, he spoke of the Board’s gratitude towards the Parents-Teachers Association (PTA) for their continuous efforts in communicating with the teachers, the Board and the parents. In addition, he hopes that the PTA will be able to continue working together towards the goal of creating a generation of selfless and high morale people. He mentioned that in the coming year, with the team of 106 experienced and highly educated teachers, parents can rest assured knowing their child is in good hands. Taking into account of the quality of the school, qualifications of teachers are scrutinised thoroughly, along with encouraging and rewarding healthy teaching habits, as to maintain the expectations of the public. Dato’ Seri also rejoiced in the fact that many of the school facilities have been through a major makeover since the flood last year, including the installation of the new water heaters in the hostels. Hence, he wishes to continue the improvements. 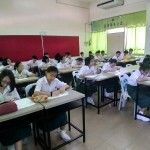 Finally, he announced that the Board hopes to implement after school tuition or counselling for students, a goal which was not achieved last year. In the speech of the principal of Han Chiang High School, Mdm Kung Bee Lee, she expressed a warm welcome to all the new students and parents. She mentioned that since our school has always believed in providing students with high quality education, they have been extremely selective in choosing the new intake of 400 students. Thus, she hopes that the selected students will seize the opportunity to strive well in their secondary years of education. She explained Han Chiang’s Board’s commitment towards shaping students in both morality and academic capability, and our school’s stress on the importance of all academic subjects, especially in language. Besides, Mdm Kung stressed on the importance of co-curricular activities, as they not only help students overcome difficulties and break through limitations, they also equip students with various kinds of abilities and a wide range of views needed to stand out individually in this competitive world. She also encouraged students to widen their outlook by participating actively in co-curricular activities and competitions, which has managed to cultivate students with outstanding performances in their academics, morale, co-curriculum and physical education. She also mentioned the establishment of the Makers Club and the STEAM education program (Science, Technology, Engineering, Arts and Mathematics), and how it will help students make advance preparations for their future and build up their self-confidence in working in different sectors. There was also an introduction towards the organisational chart of our school, to familiarise parents with the hierachy of the school. There were also briefings given by the heads of respective departments, including the Studies and Disciplinary Departments, along with the Co-Curricular Department. After a short break, students were treated to a performance by the school’s String Orchestra. At around 12 noon, the new students were led to their respective classrooms by their form teachers, and class affairs were settled. Besides the chairman of Han Chiang’s Board of Directors, those present this day included Assistant Honorary Secretary Mr Ooi Hooi Hiong, Assistant Honorary Treasurer Mr Khoo Choon Aun, Supervisor Dato Choo Chiang Meng, and member of committee Mr Liang Weng Sim. True born Penangite Mr Shamy Dutt and his wife has long decided that Han Chiang will be part of their son Dareendeep Dutt’s future ever since he was in Primary 3. 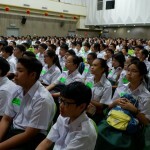 Mr Dutt expressed that Han Chiang is considerably well known, as well as maintaining their reputation of being one of the best schools over the years, which is one of the main reasons he has decided to send his son here. 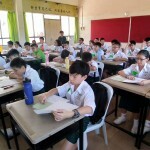 Dareendeep, who is studying in F1 next year, hails from a Malay public school, is able to converse but unable to write in Chinese, which is why his parents have decided to send him to the foundation class to work on his Chinese. They are confident that he will make friends easily as he is rather friendly and open to meeting new people. Copyright © 2016 Han Chiang High School. All rights reserved.